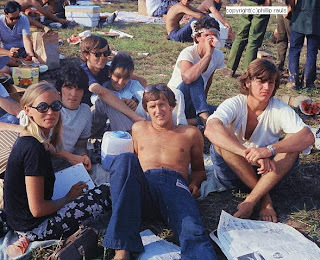 On July 4th & 5th in the year of 1969, somewhere around 200,000 young people flocked into the Atlanta Speedway to attend a Fourth of July holiday weekend of live music and festive activities. 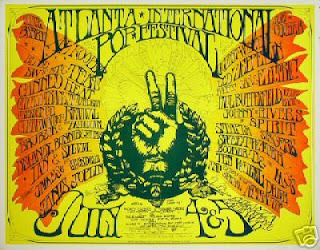 Attending the Atlanta Pop Festival was both work and play for me as I was a budding young record promoter who was still wet behind the ears. Armed with a coveted stage pass and new Minolta 35mm camera, I set out to document the event for my future archives. In this series, I have chosen only a few selected color shots. Don't claim to be the best photographer, or best record promoter, just claim to be lucky enough to have been there with a camera and live to tell about it. Hope you enjoy my trip. Please leave you thoughts in the comments section. All photographs copyrighted (c) by Phillip Rauls. All rights reserved. Duplication prohibited. 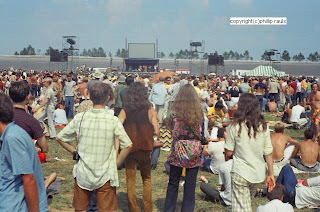 After walking for miles from our parking space located somewhere in the middle of a cow pasture, we entered from the rear entrance and the stage appeared very small and far away. I must have got whip-lash looking at all the chicks. Wow! Imagine trying to hook-up with friends who said they'd meet us there. There was a sea of people on blankets with coolers and cameras. Had to be careful where you stepped. Note the individual left-center looking through his camera while taking a photograph of me. I'm sure that he was an IRS agent following me or perhaps an undercover narc. We finally worked our way close to the stage. Damn, it was hot that day, about 92 degrees. Band members from the group Sweetwater didn't know what to think when this guy called "Starman" jumped-up on stage and began waving around this giant star that was mounted on a stick. Very trippy stuff. I worked my way to the photographers row and got some colorful shots. The entire first day I shot nothing but Kodacolor II 400 speed film. Why I don't know. What do you think of the contrast? You might recognize this band. And the vocalist also. 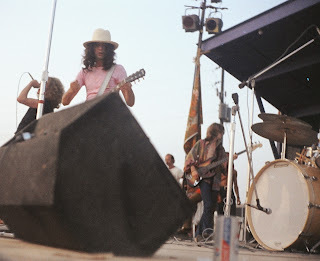 Sometime in the late afternoon, Led Zeppelin hit the stage. It was about that time that I died and went to Heaven. 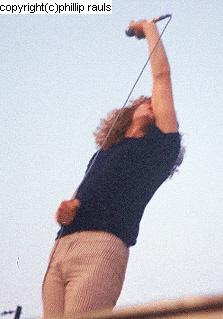 I had previously worked with the band and they must have recognized me at stage front because on occasions Robert Plant and Jimmy Page starred directly into my camera. 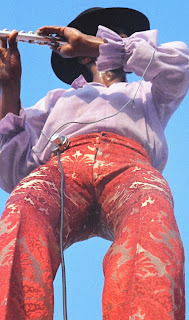 Later in the set, I shot several photos of the band from the stage. I'm saving those pictures for a book of my shots and stories. 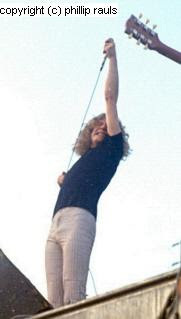 Led Zeppelin's dynamics of improvised unison set the Rock landscape for years to come. I could have swore that Page starred directly into my camera lens on several occasions. 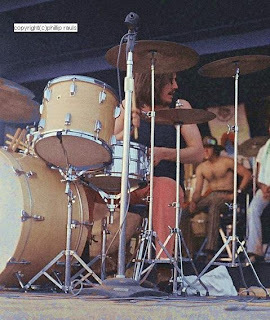 John "Bonzo" Bonham pounds his snare and high hat with brute force. 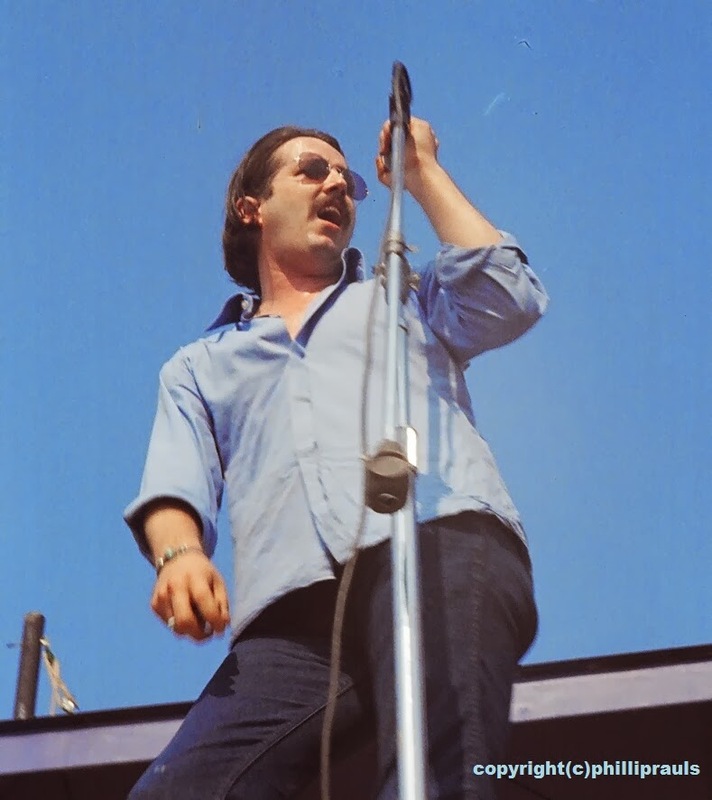 Notice his use of a 6.5x14" snare, a 14x26" bass drum and a 14x14" tom. Not your standard kit. 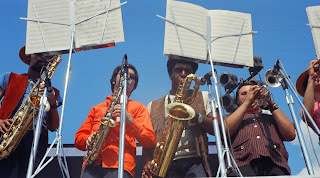 The horn section from The Paul Butterfield Blues Band blanketed the festival with the sound of brass. Delaney & Bonnie were a crowd favorite as they performed their Blue-Eyed Soul Music. In 1969, smoking pot in broad daylight was still taboo. These hippies were smoking undercover while thinking nobody would notice their activity. Festival attendants "Snuffy" Walden the guitarist from The Silver Spoon rock band and his sidekick Dennis Collins from KLOL-FM in Houston were in fine form that day. (L-R) Dennis Collins-DJ-KLOL-FM Houston, Phillip Rauls-Atlantic Records Promo, Terry Fletcher-Electra Records Promo, Scott Shannon-DJ-WMPS and unidentified female. (L-R Clockwise) Phyllis Young, Scott Shannon-DJ-WMPS Memphis, Terry Fletcher-Electra Records, unidentified female, Ken Woodley-songwriter, Larry Raspberry-recording artist and Phillip Rauls-Atlantic Records. All photographs copyrighted (c) Phillip Rauls. All Rights Reserved. Duplication prohibited.